Orestone Stakes Additional Cu-Au Porphyry Target in BC | Orestone Mining Corp.
Orestone Mining Corp. (TSX Venture Exchange–Symbol: ORS) (Frankfurt: WKN: A2DWW7) is pleased to announce the staking of an additional Cu-Au porphyry target at its Captain Property in north central BC. 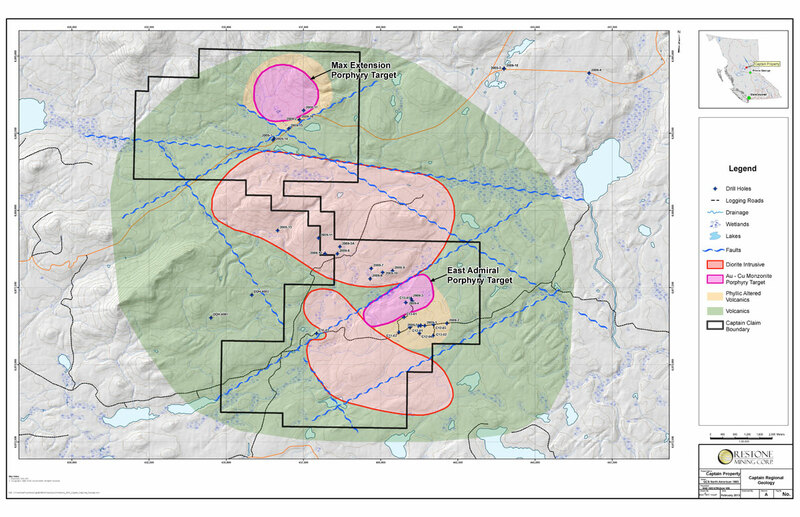 The new Cu-Au porphyry target “MAX” is located 7 km northwest of its main East Admiral Au-Cu porphyry target. The Max Extension claims cover 2,834 hectares (28.3 sq. km) and cover a phyllic altered felsic intrusive with disseminated chalcopyrite exposed along a forestry logging access road. The new Max target has marked similarities to the East Admiral zone lying at the junction of a NW and NE faults- associated with a MMI Cu-Au geochemical anomaly and quartz sericite alteration characteristic of the outer zone of a Cu-Au porphyry. The Max claims lie along a NW trending linear fault and linear magnetic high extending from the East Admiral Cu-Au zone. The Captain Project now covers 72 sq. km and hosts a large gold/copper porphyry system with multiple targets located 41 kilometers north of Fort St. James, British Columbia and approximately 30 kilometers south of the Mt. Milligan copper-gold Mine owned by Centerra Gold. The project features relatively flat terrain, moderate tree cover and an extensive network of logging and Forest Service roads suitable for exploration year around. Orestone Mining plans follow-up soil and rock geochemical sampling in 2019 to define drill targets. We are currently in the process of financing and once complete we will announce further exploration details. Mr. Gary Nordin PGeo, BC has reviewed the technical information on the project and visited the project. Orestone Mining Corp. is a Canadian based company that owns a 100% percent interest in the Captain Project and has an option to purchase a 100% interest in the Resguardo copper project in Chile.